Blood, Sweat and Gears Ride Director Scott Nelson felt the 2018 edition of the event went as well as it could. The event raised $103,000 for a variety of causes. Nelson said organizers gave away $50,000 to different organizations, including $20,000 to the Western Youth Network, $10,000 to the Hunger and Health Coalition, $5,000 to Healing Hunger Farms, $5,000 for Spirit Rides, $4,000 for Mountain Alliance, $500 to Watauga County Habitat for Humanity and $2,500 to WAMY. On top of that, BS&G makes donations to volunteer fire departments and volunteer rescue squads in both Ashe and Watauga counties. Nelson said BS&G also donated to different departments at Watauga High School, including the Robotics Club, the Sustainability Club, the football team and the baseball team. Another donation was made to the Valle Crucis eighth-grade field trip. The BS&G organization also donated $33,000 to the Winter Warmer Project, which is funded by BS&G riders. Nelson said there were 300 volunteers helping with aid stations, registering riders, working along the start-finish line, being timers, traffic control, providing any needed first aid or help with damaged bikes and feeding all of the riders when they were finished. Nelson said the economics department at Appalachian State University is sending post-ride surveys to the cyclists, which will be reviewed after a few weeks when everybody has had a chance to form an opinion. Nelson felt everybody involved with the ride did well, but they are always looking for ways to improve. Nelson said the planning committee will meet when the surveys come back to see how they can achieve that. Alas, all good things must come to an end. Scott Nelson is retiring as ride director and I think I'll be scaling down my post-event surveys (I did 5 in 2017, gasp for air). But one survey a year should be enough spark to keep the community-based research flame burning. Everyone with gifts that way should be chair of the department for a while, crummy though the job is (it is like being a foreman in a factory - neither labor nor management, chewed up by both). The work has to be done. Next month, China is expected to impose an additional 25 percent tariff on American lobster as the sparring over trade continues and Mr. Trump threatens to impose tariffs on as much as $450 billion worth of Chinese goods. Annie Tselikis, executive director of the Maine Lobster Dealers’ Association, said that Mr. Trump’s policy was having the unintended effect of further helping Canada’s lobster market, which doesn’t face the same duties when selling to China. And Canadian sellers were already benefiting from a new trade agreement with the European Union that slashed tariffs for them. China buys about a fifth of American lobster exports, Ms. Tselikis said, and the value of those exports has nearly tripled in the last two years to $137 million. Kristan Porter, the president of the Maine Lobstermen’s Association, said that he supported Mr. Trump’s efforts to renegotiate trade agreements to help American industry but hoped his was not harmed in the process. "[Hope] in one hand, [poop] in the other. See which one gets filled first." When a person wants the impossible. UPDATE: I'm adding this to our new "It's easy to win a trade war' category, as soon a John gets around to updating our category list. 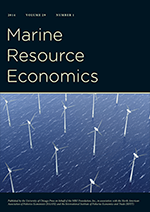 Indeed, to our knowledge, Jim’s paper was the first paper to econometrically model both the economic and resource dynamics for a single resource. This is the second time, to my knowledge, that MRE has made an effort to publish an unpublished paper (here is the first). This is quite remarkable and deserving of a pat on the back.